I am in Uganda and so far everything is going so well! Don't want to waste too much time online so I'll quickly go through everything. Staging in Philadelphia was a great time to reflect on the incredible commitment we have all made. All the people in the group are fantastic (I mean they are signing up for a 2-year Peace Corps stint in Uganda). I've already made a lot of wonderful friends. After an extremely long flight from JFK to Johannesburg, and then another 4 hours up to Uganda, we landed at Entebbe just at dusk. As soon as I stepped onto the tarmac on the shores of Lake Victoria, all my fears and homesickness were temporarily washed away as I stepped back into Africa. I was nothing but happiness that night. Since then, training days have been long but productive. We've had lectures on the role of volunteers in development (emphasizing people-to-people empowerment at the grassroots level... awesome! 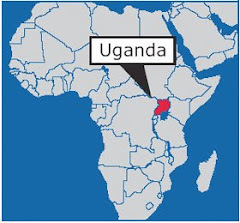 ), participatory techniques, info about Uganda and it's economic and health status, basic Luganda lessons, etc. I am exhausted by the end of the day. We just moved to Wakiso a few days ago (about 30 minutes from Kampala) and I am loving the 45 minute walk to training every morning. I'm living with a huge, wonderful host family - Dad, Mom, 6 siblings (5 have lived at home so far, but 2 are soon going to boarding school), an uncle, and a cook. They have welcomed me with open arms, are feeding me entirely too much, and have a beautiful house (even if it lacks electricity and running water). They have their own subsistence garden with matooke (plaintains), bananas, papaya, passion fruit, oranges, avocados, chickens, rabbits.... it's beautiful. I have a fantastic view every morning when I come over the crest of our hill and see the rising sun over miles of undulating hills intertwined with valleys of mist. 2 nights ago, I had a push-up contest with my family and last night the kids wouldn't let me stop taking pictures of them. I've also had such wonderful conversations with them, about everything from how muzungus (white people) blush and sunburn to how my brothers and sisters feel about caning (beating) students in school and the status of the health care system in Uganda. The weather is so far perfect (in the 70s and sunny every day). I could definitely get used to this. The food is pretty much the same at every meal - a ton of starches (matoooke/mashed plaintain, rice, posho/maize meal, irish potatoes, sweet potatoes...), beans, sometimes meat or fruit. Already looking forward to cooking for myself at my site. I am learning the language Runyankore-Rukiga (I'd never heard of it either), which means I will be living somewhere in the beautiful mountainous southwest after training. I couldn't be more excited! I have a great language teacher and only 3 other students in my class (although 8 of us are learning Runyankore-Rukiga, pronounced Roon-yawn-core-a Roo-chee-gah). More updates soon! (and by soon, I mean within a week or two. Not enough time in the day to get to an internet cafe very often!). The reality of my departure finally hit last night (aka the crying finally started). As much as serving in the Peace Corps fulfills many of my dreams, it is never easy to leave behind your life as you know it, especially family and friends, for so long. In an attempt to look toward the future rather than dwell on the depressing aspects of leaving, I continued reading The Price of Stones by Twesigye Jackson Kaguri, a book detailing how the author started a free school for AIDS orphans in his hometown in western Uganda. On the page where I left off, the author is leaving his family to return to his home in the United States. His words were so comforting because they resonated perfectly. "Morning came too quickly after a final evening with friends and family... We will all be crying shortly. It was probably the same for all families around the world. An awkward silence before leaving when one does not want to say goodbye, when the pain of family being pulled apart is too much to bear." And finally, the quote that restored my hope in seeing my family again soon is what his mother says to him whenever they say goodbye: "May the Lord keep you safe until we meet again." Indeed, I think God does work in mysterious ways - I mean, what are the odds that this would be the particular passage that would greet me as soon as my emotions began to get the best of me? I'm not an especially religious person, but you can't ignore a message like this when it stares you in the face. Speaking of which, while I was writing this, a TV commercial came on for an initiative in East Africa being carried out by Johnson & Johnson, and those images reminded me of exactly why I can't wait to get back to Africa and get down to work. Meaningful work, and in turn, a meaningful life, hardly comes without personal sacrifice. 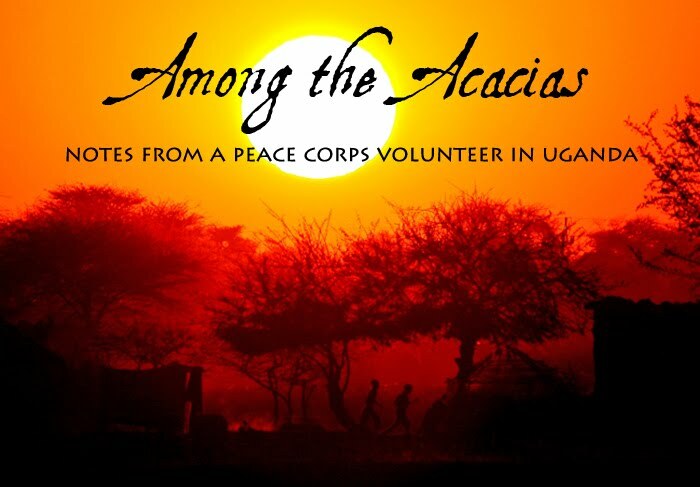 When I first started to think about Peace Corps almost 2 years ago, I e-mailed one of my professors, who is from Kenya, for his opinion on whether I should do Peace Corps, work for an NGO, or try some other volunteer experience. Reading his reply again gives me pride in what I am about to do (and hopefully he doesn't mind being quoted here): "Do the Peace Corps. Nothing would be as valuable. Nothing else would allow you to realize what you are capable of and what role you want to play. You should never perceive of yourself as helping 'others' by treating them as something different. 'Those' other people have something to say as well and you should align yourself to understand what they want to say and the rich histories and contexts that 'they' have. Development institutions, by their nature, always treat local peoples as 'others' not individuals. That is why we give them labels such as the 'poor'. I think that you would start to see things very differently if you were able to dwell in place for 2 years... I strongly believe that you have a unique ability to make a significant difference. That is why I am being very frank with you." Thank you so much to everyone for all the well-wishing, phone calls, and positive thoughts as I depart! Without your support, I couldn't do what I'm about to do, or be who I am today (cheesy but completely true). May we all stay safe until we are together again. Or, in Luganda, beera bulungi, tunaalabagana! (Stay well, we will see each other!). The logistics of the next few days: I leave my house around 5:15am tomorrow to catch a 7:40am plane to Philadelphia. I have "staging" (orientation) meetings all afternoon and get to know my fellow volunteers. Then we depart the hotel by 3:00am (yes, you read that right) on Tuesday to drive to JFK airport. There, we catch our flight to Johannesburg, South Africa, and then connect to Entebbe, Uganda. It's really happening! The bags are almost packed (hopefully they will zip! ), and I can't wait to be back on African soil in just 3 days from now! Less than 6 days to get ready now... still feels unreal. Today was my original departure date... thank goodness it got moved back! While I've been working on my preparations for departure, I've also been trying to enjoy all those aspects of American life I'll really miss. In the past week or so, I've been horseback riding, went to the John Mayer and Train concert, I've been eating lots of Ohio sweet corn, getting my fill of sushi, seeing friends and family, went to Kings Island for the first time in years (despite the fact that I can see it from my house), hanging out with my dog, going to the movie theater, eating pizza, went to the Dayton Celtic Festival, perused Borders and Barnes & Noble.... basically a really good time! Now to the serious business. Everyone's been asking me what I'm packing, so here's a basic run-down (it looks very long, and it is, but a lot of these things are small so I'm hoping I'll fit in the 80-pound limit for checked baggage, plus whatever I can fit in my carry-on). All Peace Corps paperwork, handbooks, packets, etc. Photos from home – family, friends, etc. Whew! It seems like a lot (it's all spread on my floor right now) but with some careful packing it will hopefully all make the cut!